Elvis. Czlowiek, ktorego nigdy nie zapomnisz by Mariusz Ogieglo. Rock 'n' Film: Cinema's Dance with Popular Music by David E. James. Elvis Meets The Beatles by Chris Hutchins and Peter Thompson. Also released in paperback version. This book was published under the title Elvis & Lennon in 1996. 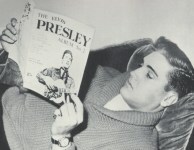 An Illustrated Guide to Elvis Presley's UK RCA Demos (1957-1981) by Alan White. I Don't Wanna Be Tied by Dennis van Tiel. That's All Right Mama: The Unauthorized Life of Elvis's Twin by Gerald Duff. Elvis et Ginger - L'histoire de la fiancée et le dernier amour d'Elvis Presley by Ginger Alden. Elvis á Hollywood - Presley fait son cinéma by Jean-Jacques Jelot-Blanc. Also released in hardback version. This book was published under the title Elvis & Lennon in 1996. Elvis Live in the 50's: The Complete Concert Recordings by Joseph Pirzada. De Gouden Troon van Elvis by Frits Verhulst. The Elvis Files Magazine Issue 15 by Erik Lorentzen. Elvis en Ginger: Elvis Presley's laatste liefde en verloofde vertelt eindelijk haar verhaal by Ginger Alden. How RCA Brought Elvis to Europe, The Nordic Elvis Presley Discography 1956-1977 by Sigbjorn Stabursvik, Hans Otto Engvold and Pål Granlund. 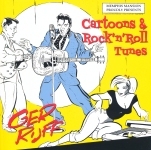 Cartoons & Rock 'n' Roll Tunes by Ger Rijff and Kenneth Dokkenberg. So said the King Elvis: Biggest collection of Quotations by Elvis Presley by Sreechinth. King For A Day by Erin Feinberg. Elvis: Special Memories by Donnie Sumner and Ed Hill. Elvis' Humor: Girls, Guns & Guitars by Steven Bo Keeley. If I Can Dream by Hal Leonard Publishing. Elvis Meets Nixon by Dylan Stance. Encore Performance V: One Performance Only, Featuring Chicago 57 by Joe Tunzi. The Ultimate Elvis Quiz and Fact Book by Scott Stevenson. Taking Care of Business - In A Flash by David English, Pål Granlund and Paul Richardson. Elvis On Television 1956-60 by Joseph Pirzada. The Elvis Files Magazine Issue 16 by Erik Lorentzen. The Elvis Files Volume 8, 1976-1977 by Erik Lorentzen. Elvis In Person - The Florida Tour August '56 by Erik Lorentzen. Elvis Style ; From Zoot Suits to Jumpsuits by Zoey Goto. Elvis On Television 1956-60 by Gordon Minto and Joseph Pirzada. The Fantastic Life of Elvis Presley by Gregory James, Bob Thomas, Paul Denis. Elvis - Das ultimative Buch über den King Of Rock 'n' Roll. 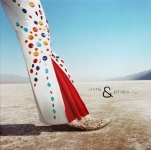 De Genesis van Elvis by Bart van Eikema Hommes. A Little Thing Called Life: On Loving Elvis Presley, Bruce Jenner, and Songs in Between by Linda Thompson. Award-winning songwriter Linda Thompson breaks her silence, sharing the extraordinary story of her life, career, and epic romances with two of the most celebrated, yet enigmatic, modern American superstars-Elvis Presley and Bruce Jenner. Good Rockin' Tonight: Twenty Years on the Road and on the Town with Elvis by Joe Esposito. Death and Resurrection of Elvis Presley by Ted Harrison. My Brother Elvis by David E. Stanley. Elvis: Le destin hors du commun du King by Marion Richaud. The Gospel Side of Elvis by Joe Moscheo. Elvis & Presley by Robert Huber and Stephan Vanfleteren. His Songs of Praise, Volume 1 by Trevor Simpson and Pål Granlund. The Elvis Files Magazine Issue 17 by Erik Lorentzen. Elvis: Truth, Myth & Beyond. An Intimate Conversation with Lamar Fike by L.E. McCullough and Harold F. Eggers. Elvis The Gospel Singer by Paul Bélard. Elvis Presley At The Mississippi-Alabama Fair and Dairy Show, September 28, 1956 by Erik Lorentzen. Elvis Dateline ...1970 - Bringing Him Back Again by Joe Tunzi. This book picks up where the best selling Elvis In the Dome ends from March 1970 to January 1st 1971. This journal will feature newly discovered and unbelievable photos from Elvis That's the Way It Is and from the June Nashville recording sessions, also unreleased concert photos exclusive to this book from September to November. Elvis Aaron Presley Portrait Portfolio. Elvis & Ann-Margret: Love In Las Vegas by Erik Lorentzen. Being Elvis: A Lonely Live by Ray Connolly. Let's Rock! : How 1950s America Created Elvis and the Rock and Roll Craze by Richard Aquila. 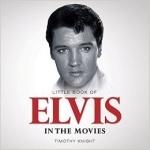 Little Book of Elvis in the Movies by Timothy Knight. Jimmy Ellis - In the Shadow of a King by Kenneth Dokkeberg, Steve Kelley and Robert Dillard. Elvis Presley by Jean-William Thoury. Colonel Tom A. Parker - Chief Potentate: Elvis's Manager... On The Record! by Darrin Lee Memmer. Being Elvis by Ray Connolly. The Elvis Files Magazine Issue 18 by Erik Lorentzen. The Year Elvis Died by Richard Lee van der Voort. Elvis and Nixon: When the King Met the President by Julian C. Arhire. Nixon and Elvis by Darrin Lee Memmer. Elvis - TCB at the Houston Summit '76: Faith, Spirit & Discipline by Darrin Lee Memmer. Elvis Presley - Album di una Vita by Ernesto Zucconi.